This research focuses on the dilemma of small Public Accounting Firms in maintaining their survival, but still maintaining their audit quality. This research is qualitative research with interpretive paradigm and the case study method. This study shows how Public Accounting Firm X faces a dilemma situation when auditing small clients with low fees, while maintaining their audit quality. Public Accounting Firm X in its survival growth strategy uses a "zebra", a "radar" and a business diamond strategy. Public Accounting Firm X itself has a dilemma when faced with a small client who can only pay a low fee for audit services, if using the indicator minimum hourly charge-out rates determined by IAPI, then the audit fee cannot be applied on the client. In the end, the audit procedures carried out must be adequate to maintain audit quality, where Public Accounting Firm X uses Excel based Standard Working Paper during audits and cuts the leveling level. Regulations that accommodate more smaller clients in the area are needed related to audit services. Adityasih, T. (2010). Analisis Pengaruh Pendidikan Profesi, Pengalaman Auditor, Jumlah Klien (Audit Capacity) dan Ukuran Kantor Akuntan Publik Terhadap Kualitas Audit. Thesis. Universitas Indonesia. Burrell, G., & Morgan, G. (1979). Sociological Paradigms and organisational Analysis - Elements of the Sociology of Corporate Life. Routledge. Carcello, J. V., & Nagy, A. L. (2004). Audit firm tenure and fraudulent financial reporting. Auditing, 23(2), 55–69. Carpenter, M. A., Sanders, W. G. (2007). Strategic Management, A Dynamic Perspective: Concepts & Cases (2nd ed.). Upper Saddle River, NJ: Pearson Education. Chow, C. W., & Rice, S. J. (1982). Qualified Audit Opinions and Auditor Switching. Source: The Accounting Review The Accounting Review, 57(2), 326–335. Hogan, C. E., & Jeter, D. C. (1999). Industry specialization by auditors. Auditing, 18(1), 1–17. Liao, Z., & Cheung, M.T. (2001). Internet-based E-Shopping and Consumer Attitude: an Empirical Study, Information and Management, 38, 229-306. Lincoln, Y. S. & Guba E. G. (1985). Naturalistic Inquiry. Beverly Hills: California. Paranoan, N. (2015). 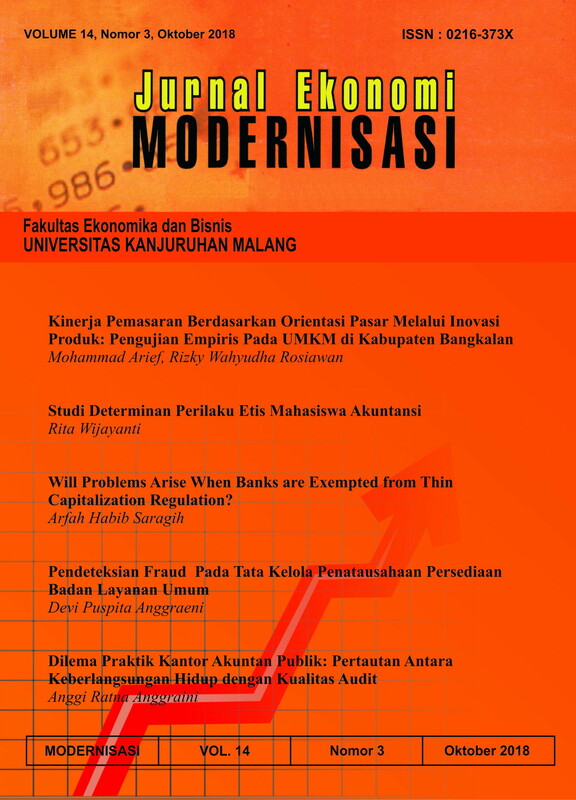 Riset Non Positivistik Akuntansi dalam Tiga Paradigma: Interpretif, Kritis dan Postmodernisme. Jurnal Ilmiah Akuntansi dan Bisnis, 10(1), 8-18. Republik Indonesia. (1995). Undang-undang Nomor 8 tahun 1995 tentang Pasar Modal. Lembaran Negara RI Tahun 1995, No. 64. Sekretariat Negara. Jakarta. Republik Indonesia. (2011). Undang-undang Nomor 5 tahun 2011 tentang Akuntan Publik. Lembaran Negara RI Tahun 2011, No. 51. Sekretariat Negara. Jakarta. Watkins, A. L., Hillison, W., & Morecroft, S. (2004). Audit quality: A synthesis of theory and empirical research. Journal of accounting literature, 23, 155-193. Yin, R. K, (2009), Studi Kasus; Desain dan Metode, Jakarta; Raja Grafindo Persada. Yin, R. K. (2015). Studi Kasus: Desain dan Metode. Jakarta: Rajawali Pers. Yuniarti, R. (2011). Audit Firm Size, Audit Fee and Audit Quality. Journal Of Global Management, 2(1), 84-97.